I completed the 366 dates of the year challenge a couple of years ago but decided late last year in a moment of boredom that I could at least have two finds as a minimum on every date. If I didn’t miss any dates, even though that’s unlikely, I should be able to complete the second round on 29th February 2016, another leap year. Theoretically I should easily have been able to find a cache on the few dates each month where I have gaps but life tends to get in the way and I still have plenty of dates to work on. I started with 64 dates and have now whittled that down to twenty five. Yesterday was one such day so I decided to look for not one cache, but seven on the mystery trail around Björsjön or in geocaching terms Bear Lake. It wasn’t a day with 13 C and sun that SMHI forecast a couple of days ago but it was around 10C and cloudy which was still quite pleasant for walking. MadChicken placed a series of caches around the lake late last year and after solving a couple of the easy mysteries I decided that I would wait until I had solved them all before going out to the lake. Two of the caches are still on my unsolved list but I decided to go out to the lake anyway. On some days it is not possible to drive to the lake and on others it is. Today the barrier at the Järvsta end of the road was up so I drove in and parked close to the first trail head. 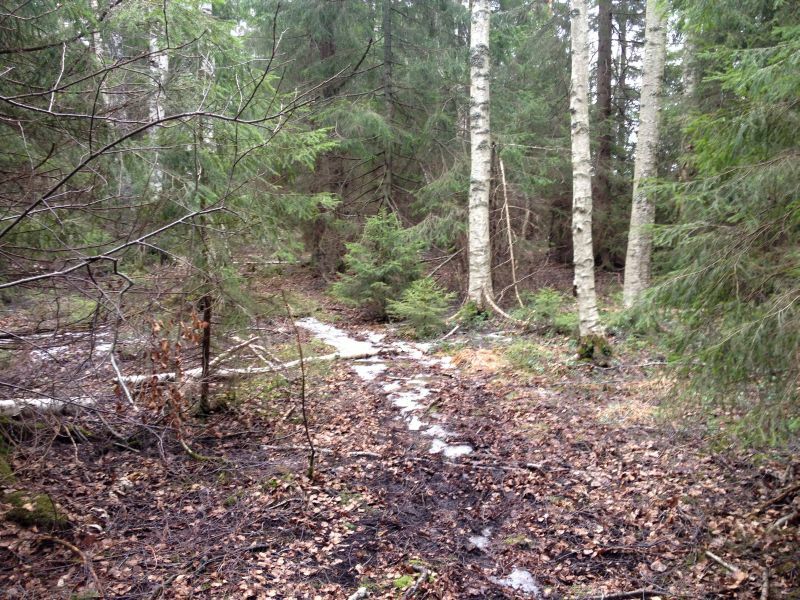 What struck me most was that there was no snow, or very little at least, in the forest. Some short stretches of path had some ice on them where the snow had been packed by walkers but otherwise it was dry underfoot. The first cache was Bear Lake #9 – Blues Brothers which told me I was doing the series in reverse! It was quickly located even if my GPS pointed me a little off GZ. As I approached Bear Lake #8 – Battlefield I realized why. The batteries were dying and that’s why the coords were way out. A fresh set of batteries cured that problem. I was busy changing batteries as I skirted a fallen tree so wasn’t really looking around me. 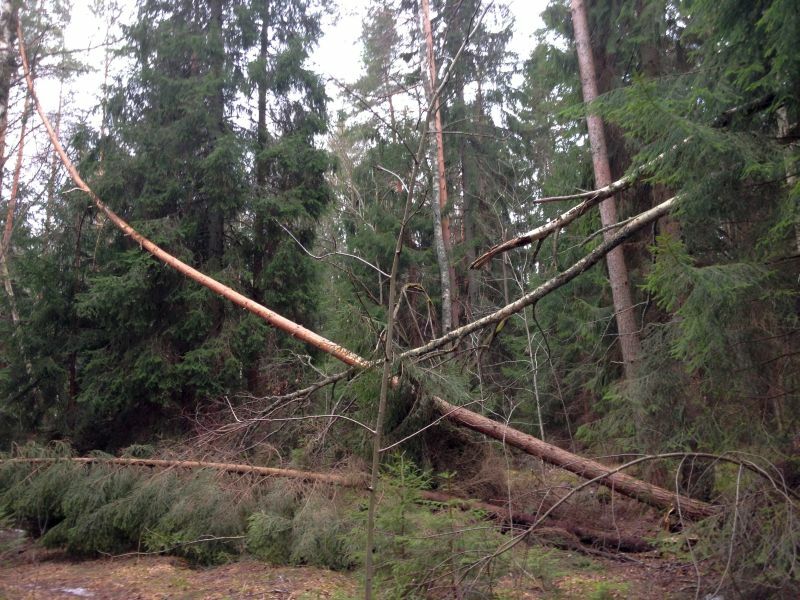 I turned back after about ten meters and saw that I had walked under a fallen tree that was precariously leaning against a tree by the path. It could easily have fallen in the one of the many gusts of wind that yesterday brought with it. Beware, you who walk here in the next few days. Don’t walk under the tree! Cache finds three and four for the day Bear Lake #7 – Picross II and Bear Lake #4 – C64 demanded a good search method as they were also not quite where my GPS was pointing, but nonetheless easy to spot when you looked in the right direction. 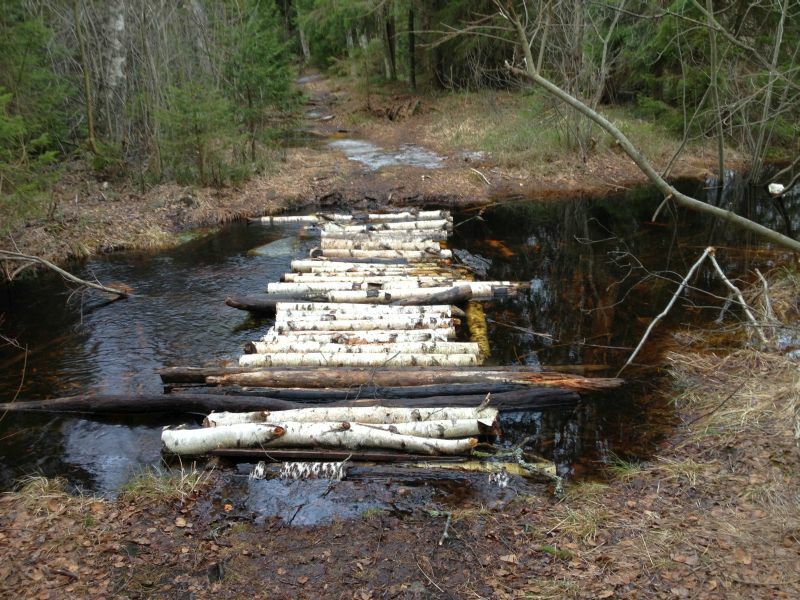 The only hinder on the way was a bridge of sorts over a fast flowing stream that was more than half a meter deep. Luckily none of the tree trunks rotated or slipped so I got to the other side without getting wet. This was where the fun stopped though. The remaining three caches in the series that I had solved had not been entered onto my GPS correctly which was quite evident from where the GPS was pointing me as it differed completely from what I remembered seeing on the map after I had solved the mysteries. Never mind. I enjoyed the walk which took me about an hour including the time needed to hunt for the caches and will come back here again after solving the final two mysteries. I can then log all five caches that remain.